Mvt. 1. Quarter note =120 (126). These however are not to be thought of as tempi that apply to a complete movement. There is plenty of evidence to show that Brahms, like many of his time, preferred a very flexible approach to speed. The orchestra will try this, at least in the Serenade. There is a wide variation in the overall timings of some Brahms’ Symphonies from one performance to another. For example, Symphony No. 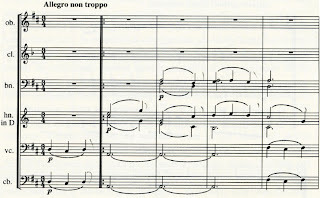 1 was performed in 37 minutes by Hans von Bülow and the Meiningen Orchestra in 1884, compared to Carlo Maria Giulini and the L.A. Philharmonic in 1981 at slightly over 49 minutes. We will be tuning to A-440. When touring, Richard Mühlfeld would send a tuning fork ahead to the next venue so that the piano could be tuned to the right pitch. His fork was at A-440. This was, however, by no means the universal pitch at the time. ‘Pitch battles’ were fought all over Europe between instrumentalists, who favoured a higher pitch, and opera companies, whose singers tried to keep the pitch lower. Often such a war would go on within the same city as in London. Pitch could vary from somewhere in the 420’s to the mid 450’s. So 440 seems a reasonable compromise! Fritz Steinbach, the conductor of the Meiningen orchestra from 1886 to 1903, used to play the opening of Brahms’ Second Symphony with audible gaps between the slurs. He modelled his performance practice style on that of the composer. Such phrasing was also discussed in letters between Brahms and Joachim in 1879. See the marks below. Stay tuned, Nic's final post will be about the most radical change for the orchestra this set: orchestra size and arrangement. What did you think about our Brahms concert?